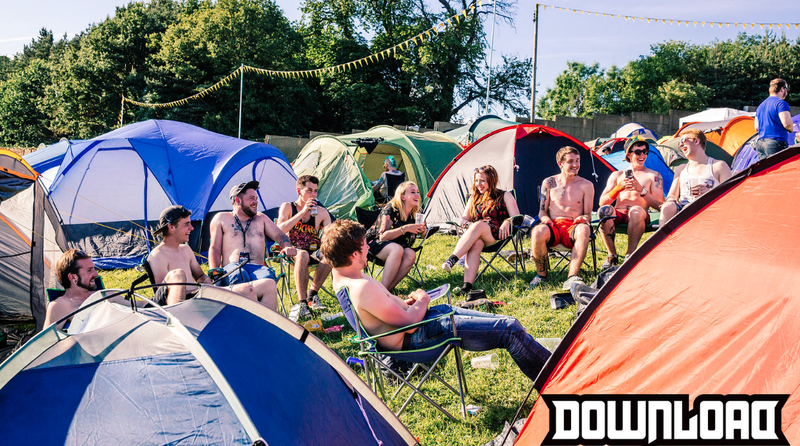 Hooraaaaah, festival season is upon us! But will you make it through, or are you ready for that post festival shower already? Fear not! I've put together a 9 tip guide based on my experiences at festivals to get you ready for the greatest events of the summer. I know for a lot of us with long hair, going 5 days without washing it can make it really unmanagable and gross. For one, nobody really cares or notices if your hair is smelly or greasy at a festival- however, about 10 days before the festival I 'train' my hair. I only wash it a couple of times in the run up to the festival and leave it for at least 4-5 days before the trip. On the morning of the festival I give it a good scrub and style! My hair is quite long but 'training' it before hand means that I can just use dry shampoo, bandanas or braid it at festivals and it doesn't get overly grubby despite rain and sweat! Speaking of sweat- the festival you go to might have beaming sun or belting rain all week, so prepare for both regardless of what the weather forecast is! It's always good to have a pair of waterproof pants handy (not stylish, I know. But festivals aren't fashion shows) or some SPF 30 in your bag. If you're in England you're likely to get a mix of all weathers, so be ready! Something that has saved me multiple times now is storing my clothes in a waterproof bag i.e a bin bag inside of my backpack. This means that even if your tent floods or your backpack gets wet (another tip- DON'T bring a suitcase! You can't roll your bag on grass, stones and mud!) that your clothes will be dry and warm for you all week. Also, don't bring any clothes or shoes that you don't want to lose or get ruined. I lost two of my favourite tees to Download Festival, boooo. Spare socks are a must too. Learning from past mistakes, a pack of custard creams is tasty but by the end of the pack leaves you wanting to throw up and never see another biscuit again. Try to buy snacks that are tinned or dry in packets and won't leave you never wanting to look at them again such as tinned fruit, meat paste (if you're not a vegetarian), pasta meals in foil tins, pot noodles etc. You're allowed to eat terrible for a week as long as it gives you energy and keeps you sustained! Festival prices are expensive. It's always good to have a bit of cash on you for spends, especially if your festival doesn't have card machines. Store this safely in a place not many people will suspect so that if somebody goes in your tent while you're watching the Chili's, they won't find it. Always have a 'reserve' of money either in your bank or in cash incase you run out and need it for that hungover post-festival trip home. Don't worry too much about wearing a face full of make-up every day. You can use this as an opportunity to dress however you want without people judging you if you wish. You can use anything to cover up your tired bags whether thats glitter, UV paint or mud from the campsite. Anything goes. You'll probably have it rained on or sweat it off by the end of the day anyway! My camp two years ago! 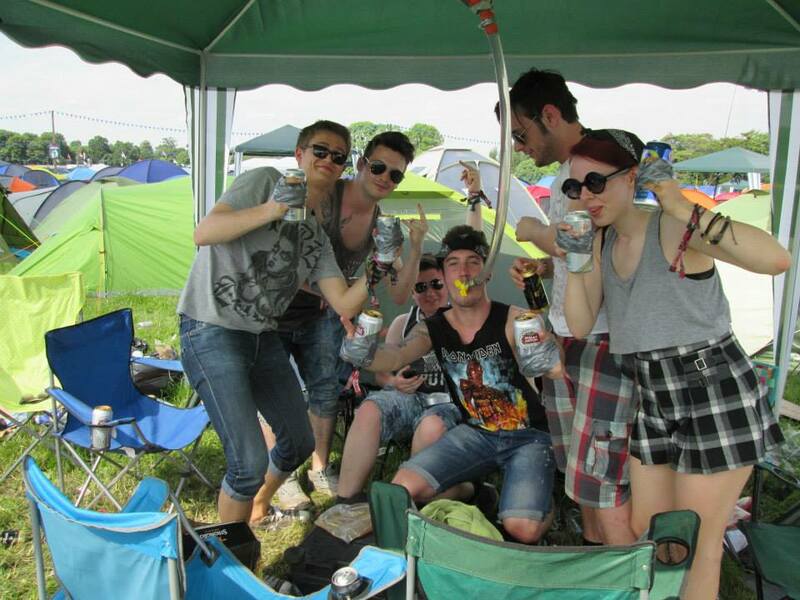 Yes, those are cans taped to our hands. Stay hydrated! Theres nothing worse than getting sick or sunstroke at a festival. Sleep if you need to, eat and drink if you need to. 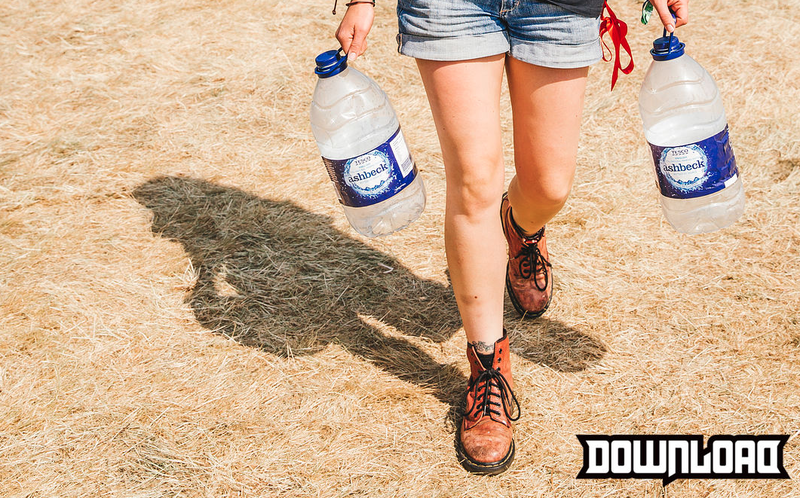 A handy tip is to carry a large empty plastic bottle into the campsite and fill it up there. There will be water points everywhere, just look on the map! This means you have clean, cold water near your tent at all times. Bring a bottle for the queue too, especially if you're getting drunk. Incase of grazes, cuts and bruises get one of your group to bring a little first aid kit with plasters, antiseptic wipes etc in it incase of minor emergency. If you're on medication such as inhalers bring a spare to keep inside this too, incase you lose yours. There are always medical tents at festivals but chances are they'll be pretty busy with bigger things to deal with than supplying you with inhalers because you lost yours (asthma is a pain) or tending to your grazed knee. Of course go to these tents if you have a situation you need medical help with. For tips on your first year of university, see this post! I hope these tips helped! If you can think of any more, share them in the comments below! What's the best festival you've ever been to? Are you going to any this summer?